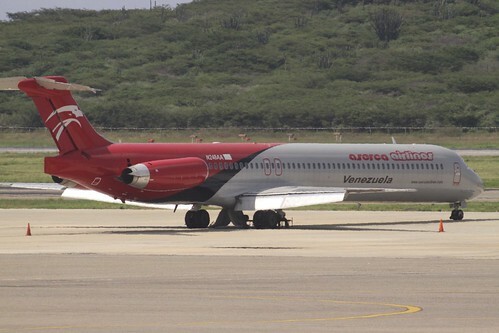 Aserca Airlines (Aero Servicios Carabobo) setzte für eine sehr kurze Zeit mindestens eine MD-90 ein, die von der Air Aruba gestellt und von Hwa-Hsia geleast wurde. Hochfliegende Pläne sahen außerdem die Einführung von bis zu 15 Boeing 717 vor, die die DC-9 ersetzen sollten. Sämtliche Pläne wurden nicht umgesetzt und die MD-90 wurden recht schnell wieder retourniert. LONG BEACH, Calif., Aug. 1, 1996 -- The Taiwan, Republic of China, based Hwa-Hsia Leasing Ltd. has ordered three McDonnell Douglas MD-90 twin-jet airliners and plans to order up to seven more. Deliveries of the first three aircraft are scheduled in August, September and October of 1998. The follow-on orders, contingent on final agreements and approvals still pending, will be for deliveries in 1999 and 2000. Hwa-Hsia will lease the aircraft to operating airlines in the Asia/Pacific area for use on their domestic routes and regional international services. The MD-90 is the newest model in the McDonnell Douglas family of commercial airliners. It is a mid-size, medium-range transport which entered commercial service in 1995 with Delta Air Lines in the United States. Hwa-Hsia Leasing Ltd., a subsidiary of China Development Corp., is the leading aircraft leasing company in Taiwan. Strategically, Hwa-Hsia is aggressively marketing the aircraft leasing business in Taiwan as well as in the Asia/Pacific region. "With air travel in Asia growing more than eight percent a year -- faster than any other area -- there will be major expansions of airline fleets," said Hwa-Hsia President Jeffrey C.J. Cheng. "We will help meet the need by leasing the best, most versatile aircraft to the operators. Our evaluation showed the MD-90 is the right aircraft to offer." The Hwa-Hsia MD-90s will be Series 30 models with seats for 155 passengers in a two-class arrangement. An advanced cabin interior features five abreast seating in the economy section, on-board entertainment systems and generous space in enclosed overhead bag racks for passengers' carry-on luggage. MD-90s are powered by a pair of fuel efficient International Aero Engines V2500 high bypass ratio turbofan engines, each rated at 25,000 pounds takeoff thrust. Their low noise levels and low exhaust emissions make the MD-90 the quietest and cleanest large commercial jetliner now in service. The engines let the aircraft take off at maximum gross weight from a 7,105 foot (2,165 m) runway, and cruise at more than 500 m.p.h. (800 km/hr) at an altitude of 35,000 feet (10,668 m). The MD-90 is 152.6 feet (46.5 m) long, with a wing span of 107.8 feet (32.87 m). Maximum takeoff weight is 156,000 pounds (70,760 kg). Fuel capacity is 5,840 gallons (22,104L); with a full passenger load the aircraft has non-stop range of 2,400 statute miles (3,820 km). An advanced technology cockpit is served by a crew of two pilots. Cargo holds under the cabin floor have 1,300 cu. ft. (36.8 cu. m.) of space, leaving valuable extra room for revenue-producing air freight after passenger bags are loaded. 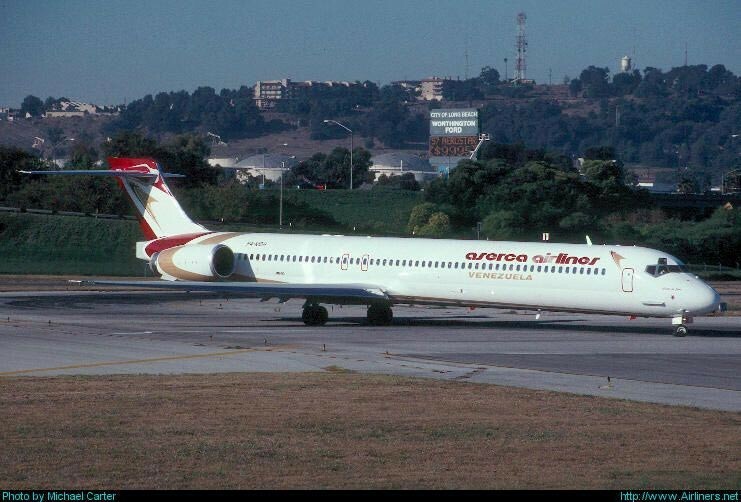 MD-90s are produced by the Douglas Aircraft division of McDonnell Douglas in Long Beach, Calif. In addition to Delta Air Lines, current operators are Reno Air in the United States, Japan Air System, and China Northern Airlines in the People's Republic of China. Scheduled to join the list with aircraft to be delivered this summer is Scandinavian Airline System in Europe. LONG BEACH, Calif., Nov. 19, 1998 -- Air Aruba and Aserca Airlines of Venezuela each took delivery of a Boeing MD-90 today, representing the latest of many deliveries of Boeing jetliners this year to carriers in Latin America. On lease from Hwa-Hsia Leasing Ltd. of Taiwan, today's delivery to Aserca also marks the introduction of the MD-90 in Latin America and the first new aircraft delivery to a Venezuelan airline in more than a decade. Hwa-Hsia has purchased a total of three MD-90s with its third airplane scheduled for a later delivery to Air Aruba. "Today is a historic occasion for The Boeing Company and our airline customers, Air Aruba and Aserca, as well as our new commercial leasing customer, Hwa-Hsia Leasing Ltd.," said John Feren, Commercial Airplanes vice president - the Americas. "I am pleased to say that by acquiring this MD-90, Aserca continues to operate as an all-Boeing customer, which is something of which we are very proud. As for Air Aruba, their new MD-90 will allow them to augment vital commercial operations to and from North America." Aserca Airlines has begun its fleet renewal programme with the delivery of a new Boeing MD-90 and is now finalising plans for additional aircraft. The Venezuelan airline has taken the aircraft on lease from Taiwanese leasing company Hwa-Hsia Leasing, via Caribbean airline Air Aruba, which has also just introduced the type. 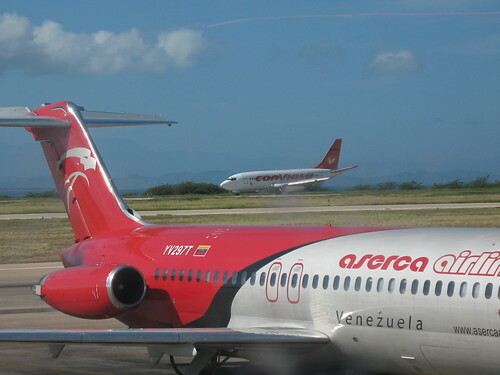 The MD-90 joins Aserca's 11 McDonnell Douglas DC-9-30s which are used on domestic and Caribbean services. Executive vice-president Dr Julian Villalbra says that the MD-90 lease comes as part of a fleet renewal and expansion programme, which could see the carrier acquiring additional MD-90s from the used market. Villalbra says plans are being finalised to add two Boeing 737-800s on lease from next April, and talks are under way with Boeing on the acquisition of up to 15 717s to replace its DC-9s. Meanwhile, Air Aruba chief executive Simeon Garcia says the airline is undertaking its own fleet renewal programme which will see its entire fleet replaced between now and 2003. "We've chosen Boeing," he adds. Three new MD-90s have just been delivered to Air Aruba, on lease from Hwa-Hsia Leasing (one of which is subleased to Aserca). Garcia says that the airline is looking to take at least two more examples, probably from the used market. The airline, which operates two Boeing 727s, two Boeing MD-80s and a DC-9, is also evaluating the 737-800. Aserca Airlines setzen im Jahre 2012 zwar keine MD-90, dafür aber MD-80 und weiterhin DC-9 ein!